The Gourley Nature Trail is officially open. 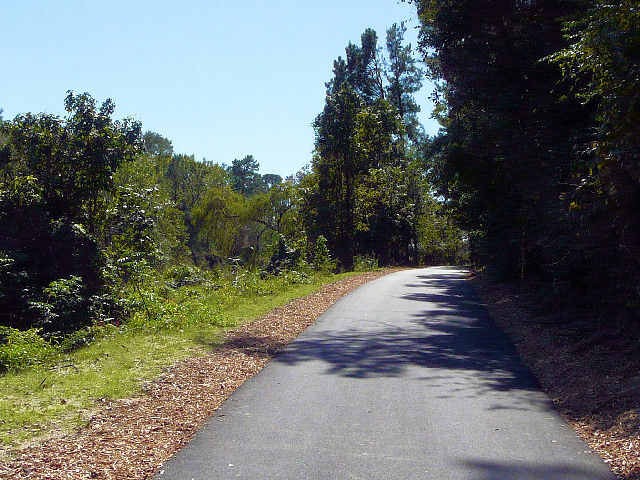 The 10-foot wide paved nature trail runs along Cypress Creek and connects Collins Park to Meyer Park, two of our largest and most coveted parks in Spring Texas. Benches and trail signs are planned for the Gourley Nature Trail with funding being provided by the Cypress Creek Flood Control Coalition and Harris County. The opening of the Gourley Nature Trail holds more significance than just connecting two of our parks. As it has the distinction of being the first official trail opening in the Cypress Creek Greenway. The Cypress Creek Greenway project proposes to connect a series of new and existing parks along Cypress Creek and Little Cypress Creek with linear parks and trail systems. With the ultimate goal of providing a continuous link of green space from east of I45 to Highway 290. During one of our recent Sunday in the Park outings, Rick and I stumbled upon the Gourley Nature Trail. We said to each other “I wonder where this trail leads?”. And we set off on our journey of discovery. We were excited when we discovered that the trail connected two of our favorite parks. And we are thrilled to find out that the trail is part of a much bigger project to create nature trails in Northwest Houston. Our area just keeps getting better and better. As we add one more reason to add to our list of Top 20 Reasons to live in Spring Texas. I guess we need to change that to 21 Reasons.